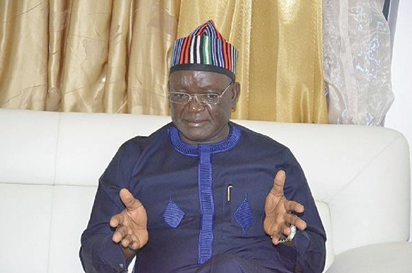 Governor Samuel Ortom has not been a happy man since herdsmen started attacking the people of Benue State, leaving deaths on their trail. The governor accuses some heads of security agencies of looking the other way while the herdsmen strike. In this interview, he maintains that ranching is the best way to stop the attacks. He also speaks on how he disarmed AK47 rifles wielding gunmen who attacked him and his driver. You are at the Presidential Villa to see Mr President. What message did you come with? I am here, first of all, to thank Mr President for his condolence visit to Benue State and to also intimate him on where we are now. I also came to remind him about the request of Benue people to him when he paid that visit and to assure him that Benue remains committed to a united Nigeria and to working with him and also to ensure that we will collaborate with the Federal Government to provide security for lives and property. It is equally necessary to intimate Mr President with the plight of over 175,000 IDPs that we have in eight camps who have expressed their desire to go back home. And Mr President is very passionate about their plight and has assured me that government will swing into action to ensure that rehabilitation is done to those homes that were destroyed. Because, if they go back home, where would live when their houses have been destroyed? That assurance has been given and he will also look at the other issues that we brought before him. It is quite assuring that it will be well and, once again, I want to use this medium to thank him for the support he has shown. I know that this crisis did not just start, it precedes his tenure. When I was serving as minister, my ancestral home was destroyed, 53 people were killed and this was in 2013 when Mr President was not yet here. But I think what is important is the NEC sub-committee headed by the Vice President is doing the needful and I believe that the meeting we held and the subsequent ones that we are going to hold will proffer a solution to this perennial problem. But we remain committed to our people and our ranching law and I believe that that is the way forward. Like I keep saying, if people have better options, let them bring it to the table. For us in Benue, ranching remains the global best practice and Nigeria cannot be an exception especially when land is decreasing and population is increasing. The 20 million cattle in Nigeria cannot cope with open grazing. There is no doubt about that and a solution has to be worked out just as it is done in India with over 300 million herds of cattle, in Brazil with about 250 million herds of cattle and in America with more than 300 million herds and there have not been clashes like the ones we have in Nigeria with just 20 million cattle. So, we must adopt global best practices and modern ways of animal husbandry. This will go a long way in helping us. And I think that, in Benue, we are winning because Miyetti Allah and MACABAN have accepted that ranching remains the best option to rear cattle. And we commend them and we will work with them to see how our law can wear human face to ensure that we have a win-win for all. And you will recall that the issue of cattle rustling is a major problem in Nigeria. Ranching will minimize cattle rustling and attacks on farms and encroachment. What has changed in Benue since the President’s visit? Well, there have some killings in flash points by these militia groups but security men are doing their best and some arrests have been made by them. I believe we will overcome at the end of the day. If not for the presence of security men, the situation would have really been worse than what we have today. We are collaborating with security agencies and we are not leaving any stone unturned to ensure that we overcome this crisis. I am not sure that if you listened to him very well. It is a misrepresentation of what the former minister said. He did not tell anybody to take up arms. He only said that people should defend themselves. Of course, you know that self-preservation is the first law of nature. You can’t just wait in your house and allow someone to come and kill you. You can resist the person, but you don’t necessarily need to have arms and I think that that was what the former army chief and defence minister was saying, that there is need for people to rise to defend themselves but not necessarily using weapons that are banned. You can use a stick to disarm someone. Some years ago, I was able to disarm armed robbers carrying seven AK 47 rifles without anything. I think that is the kind of thing he was trying to say. Nigerians should rise up to do this. Security matters should not be left in the hands of security men, it requires every one of us to put heads together and be courageous to be able to surmount it. Do we assume that there is a new relationship between you and the Federal Government? I am an APC governor and the Federal Government is led by the APC. We have always been meeting and I have said very positive things about this government before and I have not retracted what I said. The fact is that I have a challenge at hand and needed to stay with my people to be able to surmount this because they are the people that elected me. To me, Benue people are first before any other thing. I have not had sour relationship with the Federal Government. I had strained relationship with some security agencies’ heads, not even with security agencies and that was the point I was making. All I was saying was trying to add value to the security of the nation by bringing my suggestions as a former local government chairman, former minister and now governor. I think I can add to the security architecture of this country. There is always room for improvement in the society because nobody has monopoly of knowledge. We must synergize, we must corperate with one another and so, when you neglect this, and you have tragedy like the one you have in Benue State, it is not good enough. And people must accept opinions especially superior ones. When Mr President inaugurated the National Food Security Committee, many people expected that you should be a member but you are not. Are you surprised? I am not surprised because I know that six geopolitical zones are represented on the committee. If you talk about governors, the governor of Plateau State is representing North Central. So I can always send my opinion that can add value to the development of food security in Nigeria. I know that there are several committees set up by the Federal Government that I am a member of and my colleague in Plateau is not there. So it is a matter of rotating it and making sure that everybody is involved. How did you disarm the gunmen who attacked you? Oh, it was divine which I cannot even comprehend. They came, snatched my driver with my car and left with him. So I said ‘if I serve God, I will go after them and disarm them’ and I left. I was able to arrest the ring leader who brought his colleagues in his car and, once I was able to disarm him, I took him to the police station. They could not leave town until security men were alerted and they went after him, three of them fled into the bush but the ring leader couldn’t flee and my car was recovered and my driver was also recovered. This happened in 2009 in Makurdi. The post HERDSMEN KILLINGS: Miyetti Allah bows, ‘accepts cattle ranching’ appeared first on Vanguard News.